When they think about divorce, most people think of the impact the separation will have on the two spouses and how their lives will change after the fact. While it’s true that divorce will have a huge impact on the now separated spouses, it will likely have an even bigger impact on the children involved. If the splitting spouses are parents of one or more children, the primary focus of the divorce should (ideally) shift away from themselves and towards the children. Divorce can be incredibly traumatic for children. Their parents (and, in turn, their home) as they know it are falling apart, and the uncertainty and grief many children feel as a result can be overwhelming. In recognition of the hardships divorce often places on children, July has been designated National Child-Centered Divorce Month (CCDM). In honor of this monthly observance, our family attorneys in Tuscumbia MO are here to help you make your divorce process easier on your children. This is the most important thing you can do for your children. 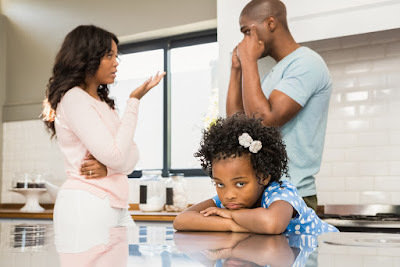 While you and your spouse are likely navigating several disagreements, it is imperative that you keep your children out of the debates if at all possible. Attempting to use custody/visitation rights as leverage only makes things harder on your kids (and may actually decrease your chances of getting custody in the long run). Keep your spousal disagreements separate from the custody/visitation arrangements. While it’s true that most couples going through a divorce are highly combative and argumentative, collaborative divorces can (and do) happen. If both spouses are committed to working through the process as cooperatively as possible, mutually beneficial arrangements can be reached much more easily. In addition to making things easier on the spouses, approaching the situation collaboratively can greatly reduce the stress on the children involved. Remember: your ex is not your child’s ex. Though you may have decided that you can no longer remain married to him/her, your children may still care deeply about their other parent and wish for him/her to stay actively involved in their lives. Talking badly about your spouse in front of your children puts them in an impossible and stressful situation. For your children’s sake, keep them out of the tension between you and your spouse as much as possible. Putting their needs first is one of the most important and valuable things you can do for your children. Though your divorce is between you and your spouse, it will inevitably impact your children in ways that you may not have not even begun to comprehend (even if you intend to approach it collaboratively). Encourage your children to talk about their feelings so that you can validate their emotions and support them through the process as much as possible. This support will make a world of difference. If you are filing for divorce at the Lake of the Ozarks, securing representation from a qualified, experienced attorney is essential. Our family lawyers in mid-Missouri are dedicated to protecting your rights and ensuring you secure the most positive outcome possible. Contact Deputy & Mizell, LLC to schedule your consultation – your initial meeting is always free!